The Chatham Anglers (6-3-2) six-run comeback victory against the Bourne Braves (6-5) on Friday marked their third consecutive game without a loss. With Saturday’s cancellation, the A’s aim to continue their three-game unbeaten run against the Cotuit Kettleers on Sunday. 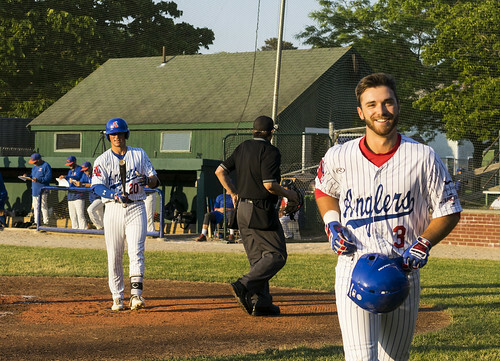 After having five of their first seven games decided by five or more runs, three of the Anglers’ last four games have been decided by three runs or less. In four games since its first off day of the season on Monday, Chatham has used its overpowering offense to make up for sequences of shaky pitching. Here’s are some notes on how the A’s have fared on each side of the ball in recent games. Chatham’s hitting has cooled off a bit since its stretch of scoring 21 runs in 23 innings last week, but not by much. The A’s still share a tie with Cotuit for the most runs in the league at 56. The Anglers’ 21 runs in their past four games have come from a wide cast of contributors. Five different A’s — Tristin English (Georgia Tech), Greg Jones (UNC Wilmington), Kyle McCann (Georgia Tech), John Rave (Illinois St.) and Spencer Torkelson (Arizona St.) — have recorded at least three hits over the four-game stretch, while nine players tallied an RBI. Chatham’s run-scoring formula has altered since Monday. After belting eight home runs in their first seven games, the A’s have scored just two runs off long balls since. Rather, it has been producing with runners in scoring position paired with stolen bases that have allowed Chatham to continue to churn out runs. The inconsistencies of Chatham’s pitching has been mitigated in its recent stretch of games. The A’s staff has allowed 15 runs in its last 26 innings. Relief pitchers Hunter Gaddis (Georgia State), Dan Hammer (Pittsburgh) and Greg Veliz (Miami) have been brilliant. The trio of pitchers has combined for ten scoreless innings in the Anglers’ last four contests while allowing five hits. Davis Daniel’s (Auburn) debut on Wednesday against Brewster displayed to A’s manager Tom Holliday that he has another shutdown starter. The right-hander tossed four innings of shutout, one-hit ball, using his 95 miles per hour fastball to fan six hitters. Jackson Wark (Saint Louis), Kyle Hurt (USC) and Jack Conlon (San Jacinto) will look to improve in their next starts. Each allowed at least six hits and two runs in their last outing, including Wark, who surrendered three runs and four hits in just one-plus inning on Friday against Bourne. Rave — who leads the A’s with a .409 batting average and .536 on-base percentage — has been one of the Anglers’ best bats a quarter of the way through the season. John Rave has a .409 batting average this season, the highest of any Chatham player. The rising junior has been getting in some extra tee-work before games, where he said he is focusing on staying up the middle. Over the last few days, the work appears to be paying off. Against Brewster, he came off the bench in the fifth inning with the bases loaded and lined a single up the middle. The next day, Rave hit a home run just to the left of straightaway center and roped another single up the middle. Holliday said the ball off of Rave’s bat is starting to sound really good, and that the centerfielder, despite not looking like a power hitter, has some pop at the plate. Four hitters have been activated since the beginning of the regular season — Jorge Arenas (Stetson), Adam Fogel (Hawaii), Drew Mendoza (Florida State) and Rylan Thomas (Southern Florida). Excluding Thomas — who played only two games with the Anglers before signing a professional contract with the Cincinnati Reds — it has taken the three other Chatham hitters multiple games to collect their first hits. Fogel and Mendoza collected their first hits in their third games in an Anglers’ uniform, while it took Arenas five games to record his first hit. Behind Torkelson and Blake Sabol (Southern California), Chatham leads the Cape League in home runs with 10. However, the team is second-to-last in doubles with eight and are tied for last with zero triples. Chatham is the only team in the CCBL that has more home runs than keystone hits. The A’s return to Veterans Field for its second Sunday doubleheader of the season, this time coming against the Cotuit Kettleers. The two highest-scoring teams in the Cape League will face off for the first time this summer, with game one scheduled for 5 p.m. and game two expected to start around 7. The following day, Chatham will have its second off day of the season before returning to action against Falmouth on Tuesday. Broadcast coverage of the Anglers and Kettleers on Sunday begins at 4:40 p.m. with the Anglers Extra Pregame Show. Listen to Cooper Boardman and Josh Schaefer on TRZ Teamline or listen by phone at 1-800-846-4700, code 3841. For more information, visit Broadcast Central.